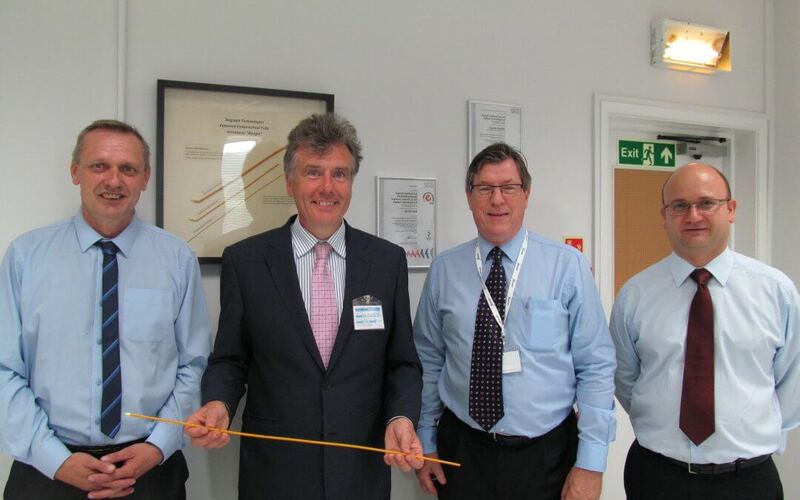 Neil Carmichael, MP for Stroud, visited specialist healthcare company Xograph Technologies, part of the Xograph Group, which is based in Stonehouse, Gloucestershire in the UK. During a tour of the new headquarters which is based on a 2.8 acre site and comprises an administration building and behind this an R & D, manufacturing and warehouse facility, Mr Carmichael was able to see the whole process of product development from concept and design, through prototyping and on to full scale manufacturing. He met with Group CEO Peter Staff, General Manager Mike Biro and Neil Cant who is responsible for product development and manufacturing. Featured Image: Neil Cant, Production and Development Manager at Xograph Technologies Ltd, Neil Carmichael, MP, Peter Staff, Group CEO and Mike Biro, General Manager for Xograph Group Ltd.